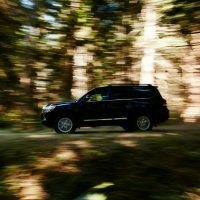 If you live in a snowy climate, the Toyota Land Cruiser is highly capable, and is aimed at the family who needs guaranteed control on an icy road leading to a ski area, or safe traction on the dirt road leading to a mountain house, or headed into those mountains for a weekend biking or hiking trip. Need to pull something for recreational use? 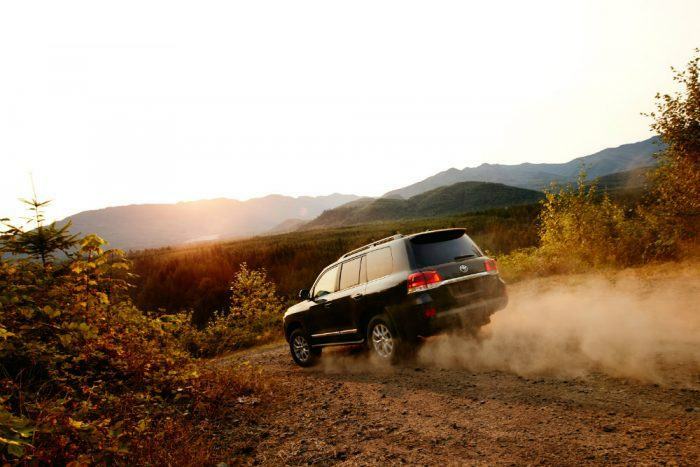 The Land Cruiser can even tow boats or horse trailers up to 8,100 lbs. 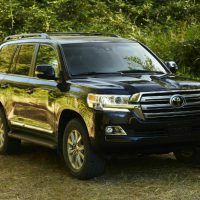 Following a substantial freshening for 2016, the Land Cruiser is little-changed for the 2018 model year. 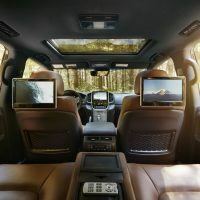 The rear-seat entertainment system, formerly standard, is now an option. 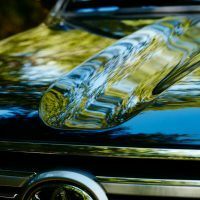 Outside mirrors now fold inward as the vehicle is locked. 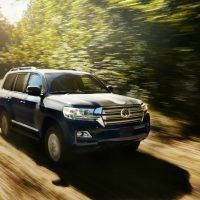 What hasn’t changed is the Land Cruiser’s ability to handle big loads, haul heavy cargo, and transport people and gear in comfort. It comes with a heavy-duty architecture for handling bigger jobs. 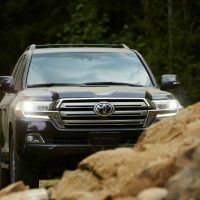 The 2018 Toyota Land Cruiser ($83,665) comes with four-wheel drive, eight-passenger seating, four-zone automatic climate control, semi-aniline perforated leather seat trim, heated/ventilated power front seats, a cooler box, push-button start, LED headlights, and 18-inch wheels. 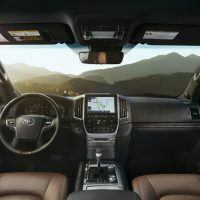 Infotainment features include a 14-speaker JBL audio system, a nine-inch touchscreen, and an optional rear-seat entertainment system with a DVD player and dual 11.6-inch screens. Total MSRP including destination: $84,960. 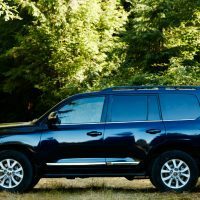 At first glance, the Land Cruiser almost resembles a luxury sedan. 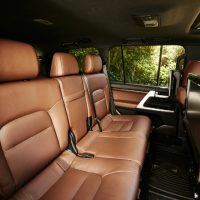 There is abundant interior space and plenty of leg and headroom in both the first and second rows. Front seats are wide and well-padded, helping to provide excellent views and room for taller drivers. Row two isn’t far behind in comfort, with room for three average-size adults. 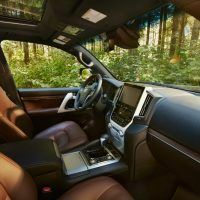 The semi-aniline leather upholstery feels luxurious, and there is some hard plastic trim likely for ease of cleaning after a long camping or hunting trip. 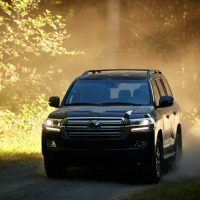 At the center console, controls for the transfer case and four-wheel drive system sit alongside a conventional gearshift lever. 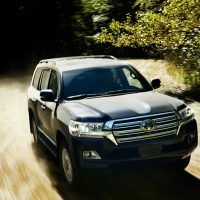 Land Cruiser’s upright, symmetrical dashboard is packed with large buttons and knobs, yet most controls are accessed through the infotainment screen. 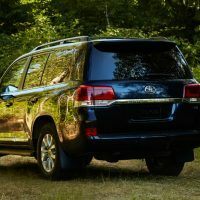 The third row is ideal for kids, with a truck-based configuration with two removable seat halves that can fold upward when not in use for more cargo carrying ability. 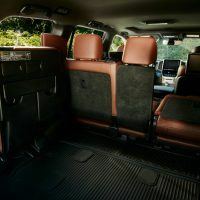 Cargo volume totals 16.1 cubic feet behind the third row, expanding to 43 cubic feet when those seats are folded away. 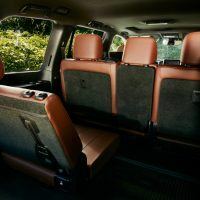 Removing the third-row seats and folding the second-row seats boosts space close to 82 cubic feet. 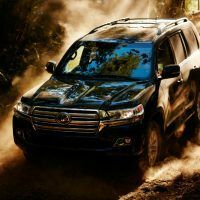 Toyota offers just one engine for the Land Cruiser: a long-proven, 5.7-liter V8 generating 381 horsepower and 401 lb-ft. of torque, mated with an eight-speed automatic. 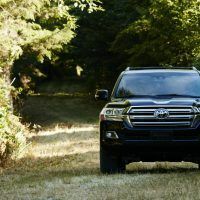 Every Land Cruiser has full-time four-wheel drive, with a locking center differential and a two-speed transfer case that permits low-range operation. EPA fuel mileage ratings come in at 13/18 city/highway and 15 combined mpg. 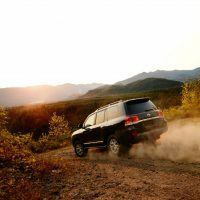 Out on the road, the Toyota Land Cruiser is smooth, quiet, and comfortable for long trips. 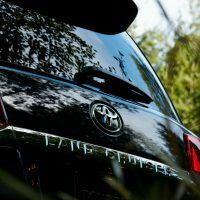 The high seating position gives the driver and passengers a commanding view of the road ahead. It left us with a feeling of superiority over the rest of the crowd on the highway. 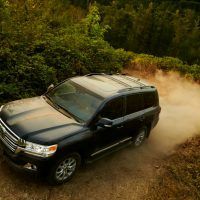 And the big 5.7-liter V8 with its massive torque rating helped with that superior feeling. We were able to power by anyone who was going too slow by pushing the gas pedal to the floor. The big V8 responded well and took us anywhere we wanted to go quickly. 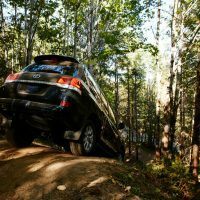 We didn’t have a snow storm this week, but the all-wheel drive SUV powered through the off-road course near Morrison, Colorado. 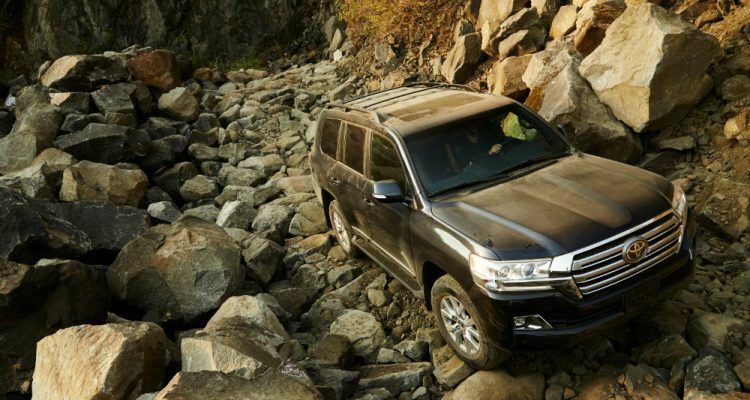 The Land Cruiser’s four-wheel drive system has four modes, actuated by a toggle switch on the center console. 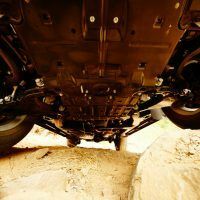 It can be operated by locking the center differential in high or low-range. 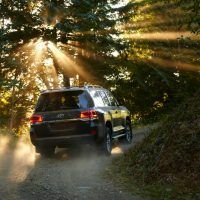 We encountered patches of ice on the road, and locking the center differential helped maintain grip as individual wheels encountered the slippery surfaces. 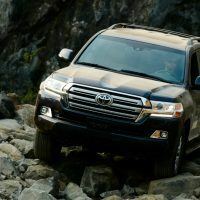 The Land Cruiser is a big vehicle and the only downside is parking and maneuvering it in the city, which can be challenging. 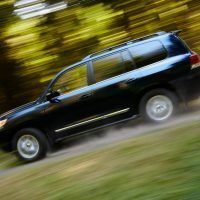 But parking is made easier with its low-effort steering at slow speeds. Visibility was an issue as we headed over the crest of a hill in the mountains because the hood is tall. We lost sight of the road as we approached another car. But on the open road, it works. 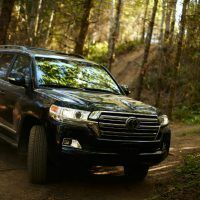 The 2018 Land Cruiser offers plenty of utility, exceptional capability off-road, towing power, and Toyota’s reputation for build quality. 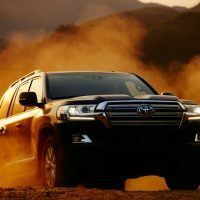 The big vehicle is relaxing to drive on long trips, gliding down the open highway with ease. 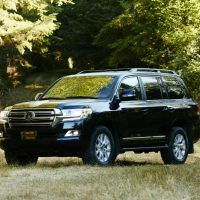 For those who live in the country or a rural setting, the Land Cruiser will handle big loads, haul heavy cargo, and transport people and gear in comfort. 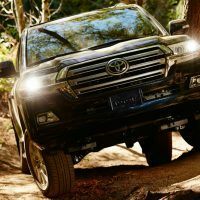 2018 Toyota Land Cruiser Official Site. 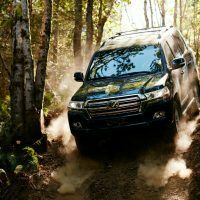 2 Comments on "2018 Toyota Land Cruiser Review"